Intel’s Skylake series of processors have already been out in the open for quite some time but the actual details of the micro-architecture have been withheld by Intel. The next likely event where Intel may decide to reveal the minute details about its Skylake uarch is at IDF in a few days. A report by Heise.de however, sheds some early light on what the actual rabbit in the figurative hat might be. Something we have suspected for quite some time now, something that is being dubbed as inverse hyper threading by the rumor mill. 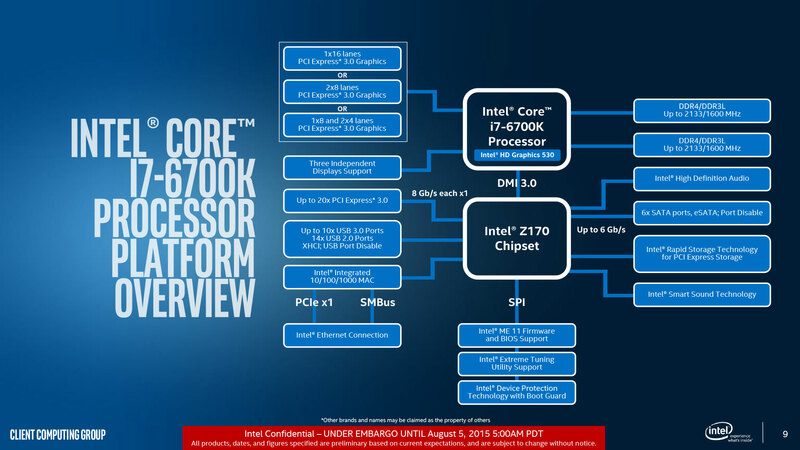 An Intel Slide from the Skylake launch – revealing only a bare minimum of information about the platform. Although I am sure everyone would be more or less aware of what hyper threading is but I will stay go over the basics for the sake of thoroughness. Hyper Threading, simply put, is the ability of a physical core to host more than one threads (in our current HT application – two). In Intel, a hyper threaded core is able to run two logical threads for better multi tasking ability. 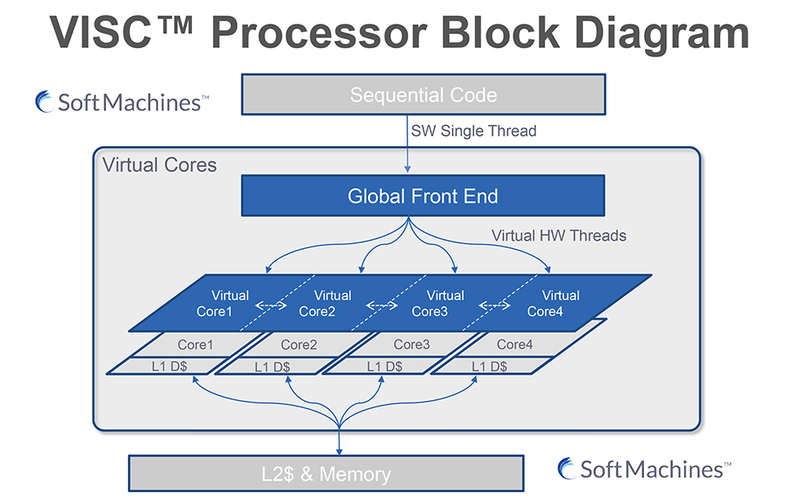 Therefore, a modern Core i7 has 4 physical cores but a total of 8 threads. Inverse Hyper Threading then, is the ability of multiple (physical) cores to run a single thread or a “big” logical core. This idea is something that has multiple prototype variations and implementations – most notably VISC and MorphCore. It goes without saying that the actual implementation might not be called inverse hyper threading, MorphCore or even VISC, but the general idea behind the implementation is pretty standard. We have already talked in depth about MorphCore before and here is a short summary of the impacts of VISC based architecture. ““The VISC architecture achieves 3-4 times more instructions per cycle (IPC), resulting in 2-4 times higher performance per watt on single- and multi-threaded applications. Moreover, VISC uses a light-weight “virtual software layer” that makes VISC architecture applicable to existing as well as new software ecosystems.” The company claimed in its press release. The following benchmark is a result of the SPEC CPU2006 suite courtesy of Heise.de. The first 4 points on the x axis represent physical cores, and the next 4 represent logical cores. 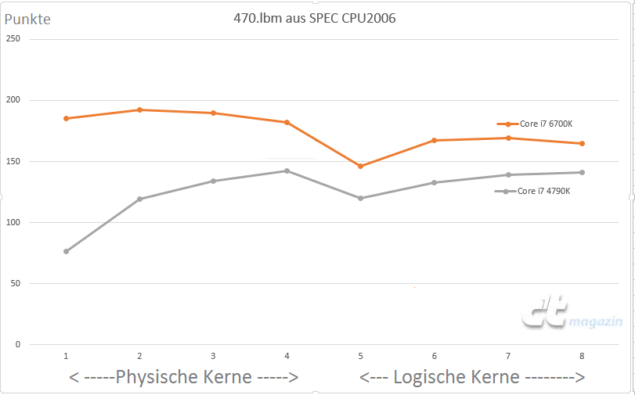 As you can see, single threaded performance has taken an absolutely huge jump from the Haswell counterpart to Skylake. Infact, the performance doesn’t increase as more threads are activated. It actually goes down. This is a trend that is the exact opposite of the Haswell counterpart in which performance increases as more threads come online. The reason why this could be happening is because all 4 physical cores are already powering the single thread so as more threads come online, software inefficiency results in a declining trend. This obviously means that there is going to be an absolutely, absolutely massive boost in performance of single threaded applications in which a Skylake processor is used. This is pretty huge folks. Also (caution: opinion), I suspect, part of Intel’s “Global Shortage” has something to do with the fact that they have yet to reveal the biggest selling point of the Skylake processor to the consumers. Which go a long way in exponentially increasing demand. The flexible scaling of the “front end” logical core or cores has been inevitable in microarchitecture for a long time. We already had the ability for big cores to be broken down into small (logical) cores – so it was only a matter of time before we got the ability to combing big cores into an even bigger (logical) core. At any rate, we will learn more about just what exactly is going on underneath the hood at IDF, very soon.